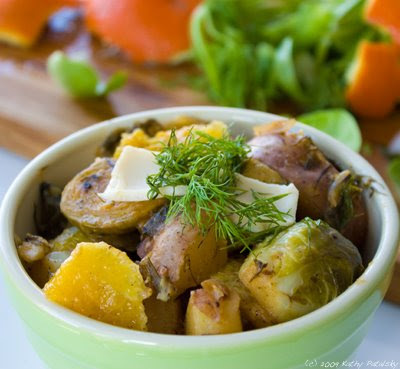 "Cheesy" Dill Potatoes & Citrus Braised Brussel Sprouts. Veggie Challenge! 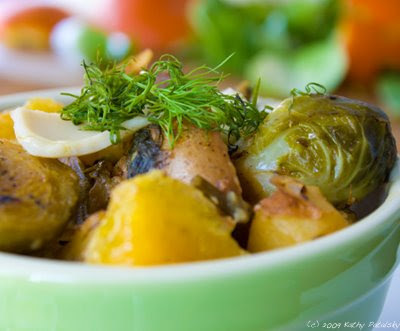 Hated Vegetable: Brussel Sprouts. My recent survey showed that brussel sprouts are one of the most hated veggies out there. So I'm going to be posting a few recipes that turn the haters into lovers. 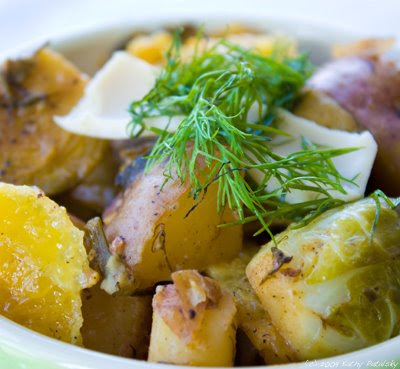 Who could possibly resist the cheesy dill potatoes part of this recipe....? 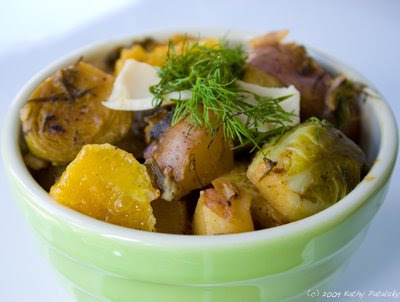 Vegan "Cheesy" Dill flavors and Citrus-Braising makes any veggie delicious! 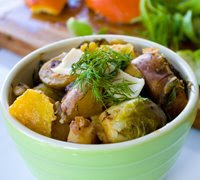 This recipe for Cheesy Dill Potatoes and Citrus Braised Brussel Sprouts is a healthy and cravable answer to the question: What new veggie side dish should I make tonight? 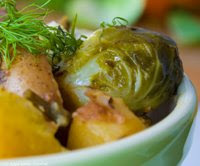 To rev up your tastebuds and boost your nutrient-know-how for some brussel sprouts: Get the nutrition facts: Brussel Sprouts are a Super Veggie. Silly Dill. Dill is a lot of fun to work with. You end up having fern-fingers. 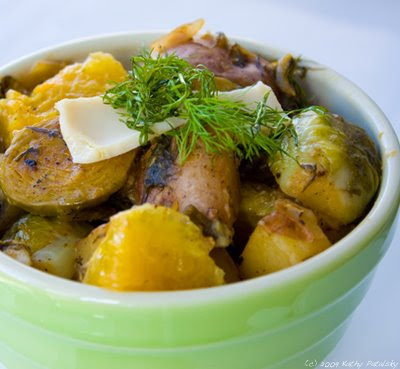 I used to hate the taste and smell of dill, but when paired with the right foods: a little citrus, some mellow creamy cheese, tender potatoes, ect. 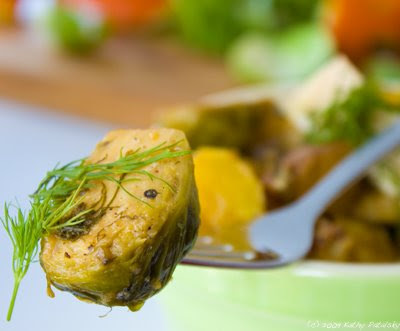 the dill can be incredibly refreshing and fragrant. I like doing a combo of fresh and cooked dill simply to mellow the flavor even further. 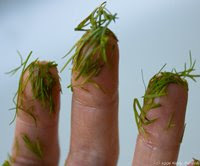 Cooked dill can get a bit soggy like seaweed, so you want to try and chop in finely if this bothers you. Give dill a try and that 'first sniff' shouldn't scare you anymore. *jalapeno cheddar flavor, rice vegan singles are my favorite cheese option. Cut off brussel sprout ends. Remove loose or wilted leaves. Slice off long stems of dill herb bunch. Chop dill coursly. Add in Brussel Sprouts, onions, agave and half of tangerine juice. Char surface of brussel sprouts. 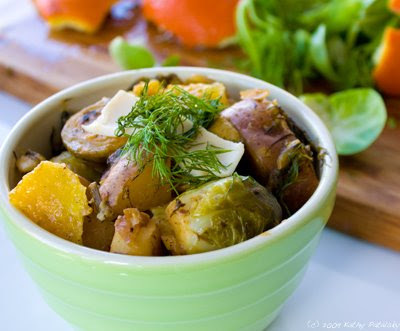 *TIP: Cooking the sprouts gently will allow more enzymes and nutrients to stay in tact! Check out the Most HATED, LOVED and FEARED Veggie survey here: SURVEY SAYS! Brussel Sprout Super Veggie Facts here: Brussel Sprouts - Super Veggie!